Future Ventures India Ltd (BSE: 533400, NSE: FUTUREVENT) on Wednesday, 9th May 2012, had a major institutional buy when BNP Paribas Arbitrage acquired 2.50 crore shares of the company through a deal executed at BSE. This was disclosed by Bombay Stock Exchange after normal trading hours on Wednesday. There was a matching seller for the mega deal, when Mixon Holdings Pvt Ltd sold off 2.45 crore shares. Both the buy and sell were at Rs. 8.50 a share, and BNP Paribas’ buy was worth Rs. 21.25 crore. As of Q4 end, the noted FII held no significant stake (upwards of 1%) in this company belonging to Future Group, promoted by businessman Kishore Biyani. With Wednesday’s buy, BNP Paribas has acquired a significant 1.59% stake. Other listed Future Group companies include Pantaloon Retail (India) Ltd, Future Capital Holdings Ltd, and Agre Developers Ltd.
Pantaloon Retail, India’s leading organized retail business, had recently decided to hive-off its flagship Pantaloon format stores to Aditya Birla Nuvo for a consideration of Rs. 1600 crore. The move seems to be a desperate measure by the debt-ridden conglomerate to reduce its interest burden urgently, as the much awaited FDI in retail was not being approved by the Government. Future Ventures India Ltd has also not been in a good shape since its IPO in 2011. The firm, which is a kind of holding company that has varying stakes in different group companies and brands, posted a consolidated net loss of Rs. 49.78 crore on a revenue of Rs. 652.50 crore, in the first three quarters of FY’12. Wednesday’s seller of Future Ventures, Mixon Holdings Pvt Ltd held 2.50 crore shares or 1.59% stake as per the latest Share Holding Pattern (SHP), and if it hasn’t done any fresh purchases post Q4, Mixon has now sold off all but a minor stake of 0.03% in Future Holdings, which reveals a total exit strategy. Mixon Holdings Pvt Ltd is registered as an NBFC and shares its corporate address with Bilakhia Holdings, and is most probably an investment arm of Mumbai based Bilakhia Group. Bilakhia’s group companies include Micro Inks, Bilag, M3 Investments, Micro Lifesciences, and Mexus Education. Micro Inks was a listed company, and was later part acquired by Huber Group, and was de-listed in March 2010. Reflecting its fundamental challenges, Future Ventures stock had also failed to do anything impressive post its April 2011 IPO. For an IPO priced at Rs. 10, its 52-Week High stands at just Rs. 10.05 while its 52-Week Low recorded recently on Monday, 7th May, stands at Rs. 7.80. One major issue with the stock is its huge equity base, which when coupled with its struggle to make even a small profit, has ensured that there is no EPS visibility even for the upcoming quarters. However, like all such large equity-base companies the promise is definitely of very long-term nature, and Future Ventures has proven that it is capable of improving revenue dramatically. 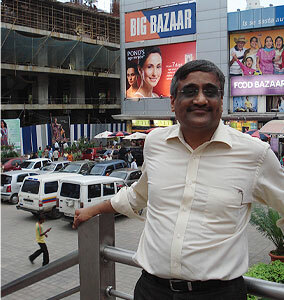 However, Future Ventures has only limited participation in two of Kishore Biyani's most well-known chain-store operations - Big Bazaar and Food Bazaar. The real value in the company would only be unlocked when its major investments like in Indus League Clothing, Biba, Holii, Aadhar etc are demerged or listed, and its investments in the FMCG and food park businesses make returns. Future Ventures holds a 90% stake Indus League, which owns men’s apparel brands like Indigo Nation and John Miller. On Wednesday, the stock closed at Rs. 8.49, up by 5.99% in BSE.